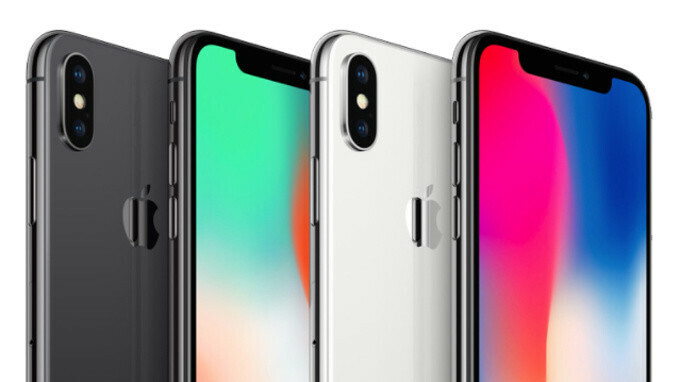 Apple iPhone X sales are "stellar" in China and Japan, and it is the best selling phone in the United Kingdom in November, according to research firm Kantar Worldpanel. The big highlight of this story, however, really is China, the world's biggest phone market, where the iPhone X is performing incredibly well. While switchers to the iPhone X in other markets come from upgraders from earlier iPhones, in China the overwhelming majority of iPhone X buyers come from Android users. The iPhone X was also the best-selling phone in the UK in November with a 14.4% share. It is not all roses, though, as the overall iOS market share declined, while Android increased its market presence in the three month period ending November 2017 compared to the same period last year. You can see Kantar's breakdown of estimated iOS and Apple market share for different markets below. Some up the table results. 9 out of 10 Android rose. 8 out of 10 Apple dropped. So what where these results suppose to highlight again? How is that possible? PA experts in comments were reporting "abysmal sales"
If you have eyes to see that report table.. You can see that % change is minus for iOS on 7 out of 10 regions.. And since this article in on PhoneArena, the writer need to make it looks like iPhone's sales is doing good..
Why specifically "Urban" China mentioned multiply times? Maybe urban only gets decent sales only. In this case its cherry picking. What increasing number of OEM? Huawei and Xiaomi and Oppo have been around for years. They simply didn't have high sales. Now that they make very high quality devices, they are simply selling more. The amoutn of Android OEM's have not change. Please lit who the new Android OEM's are. Blackberry is the only "new" one and their marketshare is only slightly above Windows Phone. In other words they are nit a siguinificant plater. Samsung, Huawei. LG are the big players and Huawei increase it sells 10 fold compared to where they were 5 years ago. They surpassed Appel in sales. But they are not a new OEM. What you said is just false and trying to make excuses that you don't even need. A platform with more flexibility will always top Apple, no mater what. So what. Everyone can't be on top. Apple doesn't want to be. When you pan yourself as a luxury brand, you can't be on top, because you will make less money. You do realize also that it is nonsense to present them per OEM's because Apple has no competitor for iOS. That is why it is sensible to compare it based on OS. Imagine if iOS will be offered by other OEMs, do you think Apple will have significant sales? Do you think they will price the iPhone X for a thousand bucks? Come to think of it? But samsung still charge 950 for Note 8 despite having loads of competitors. Come to think of it? Until the day comes that OEM's release official sales numbers, anyone can make up anything. When you consider the population of Shanghai along, 6% isn't a huge number. After all, the article states Apple's marketshare still went down. Asian do love the iPhone. Here in the Philippines, everyone wants an iPhone. The 64GB X here is roughly$1300USD. When you consider the average income of a typical Filipino, which is $350USD per month, doesn't leave room to buy such and anyone with an iPhone is considered rich For 2016, Globe Telecom which is the largest carrier here, only sold a total of 1.5M iPhone. Which when you consdier the fact that the population here is just over 1/3 the US population, thats a very small number of sales. http://www.marketing-interactive.com/majority-filipinos-now-4g-prefer-samsung-apple/ Mobile Vendor Market Share in Philippines - December 2017 Samsung	30.13% Apple	17.2% I like the iPhone X, I just don't understand why Apple chose to support only 64bit apps and not support 32/64 together like Android and Windows does. "Apple wants to get rid of dead apps," says Eliran Sapir, CEO of app analytics company Apptopia. "By forcing developers to update their apps or face removal, they are essentially able to weed out the dead apps which are no longer relevant and are clogging the store and ruining discovery for everyone else." Google should do same too, seriously who needs apps which devs doesn't care enough to turn them 64 bit, it's not big thing to do. They had three years to do that, should be enough time. So, if the table on the article will be my basis as judgement for Japanese. A lot of them are isheep. Yup, those numbers from Japan have always surprised me. Japanese people are some of the most prideful people in the world. For example most of them would not buy an American or Korean car, or some other products like TVs and computers even if they live in the US, however they just love Apple products. It's like some kind of double standard. They managed to find 1½ places where the X isn't failing biggly, even though the full detail of the UK sales is a massive shift towards Android, like every other country except for China... "Stellar sales for the iPhone X", feels a bit overcompensating for something? One thing to remember, this quarter Apple technically had not one, not two but three different new flagship models up for sale. X have sold over 35 million units so far, i can't see how it's failing. "One thing to remember, this quarter Apple technically had not one, not two but three different new flagship models up for sale." Exactly, that's why iPhone q sales are going to very strong. Apple have 3 best selling smartphones in the world now. And remember, Apple makes more money per unit in margins than anyone else, so every one of those $999 iPhone X's bags about $650 in straight profits. $650 times 35 million is over $22 billion in pure profit just from the X, and for only a partial quarter of sales. It is undeniable, regardless of whether you think iPhones are the best of the best, or whether you think they are utter garbage, that Apple has figured out almost perfectly what the right blend of effort is (between marketing, design, production, logistics, etc.) to make off with most of the industry's profits even though they only make a little over 12% of the industry's total device output. And while they are decreasing in overall share right now, they are also increasing the margins, and will likely continue to do so. Apple is one giant engine for converting some raw materials and many bought components (built by other OEM's, on Apple's orders for them) into an army of objects that bring in the cash. They have already won, because they are now the only company in the sector that can afford to experiment with enough new ideas to come up with whatever's next in a way that works and is popular. For those that are making the party for the % in the comparisson table, it clearly indicates a period of three months, form september to november (being only november where X was available, though not having the best production). It's interesting, averyone see what they want to see. I will wait for the X plus. Considering how many models iPhone have and how much it cost compared to a multitude of android models in the market, apple being able to sell that much phones is really incredible. The headline sounds as if IOS devices had an unbelievable quarter. 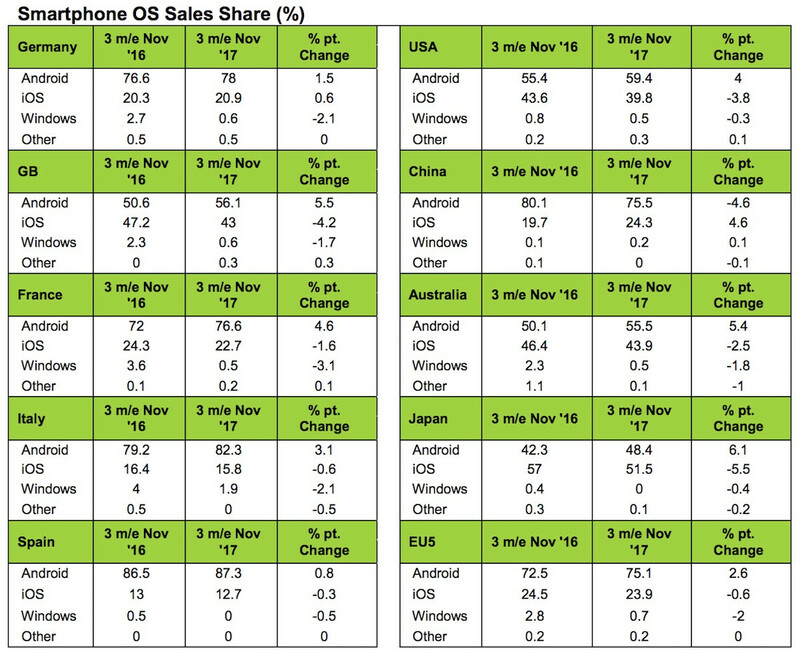 Read the data and you will see in a launch quarter, IOS market share fell in most countries including Apples home ground. Add to that this was meant to be the launch of a "supercycle" year and you can only conclude that it was pretty poor by Apples standards.